Four third-year members of the State Bar Board of Governors announced they intend to seek the presidency of the organization. Paul Hokokian of Fresno, Palmer Madden of Alamo (Contra Costa County), Clara Slifkin of Los Angeles and Thomas Warwick of San Diego threw their hats in the ring April 1. A fifth eligible governor, Valerie Miller of Chico, said she will not run. The new bar leader will be elected by the board June 10 and will be sworn in as the bars 75th president in September. The candidates generally view 2001 as a year to continue stabilizing the bar, but they also hope to propose some innovations and take positions on concerns facing the legal profession. All four cited the internet as either a vehicle for communication or a practice venue which deserves scrutiny. They differ on where the bar should place its priorities, citing issues as widely disparate as discipline, collegiality, competence, long-range planning, and multidisciplinary and multijurisdictional practices. The California Supreme Court last month reaffirmed its procedure for handling attorney discipline cases, ruling that lawyers are not entitled to automatic review where a petition is denied. In a 36-page decision, the court said it is not compelled by constitutional principle or legal requirement to hear oral argument or render a written opinion in attorney discipline cases where a writ of review has not issued. The court also reinforced its ultimate authority over the attorney discipline system, saying the State Bar Court makes recommendations only and has no judicial power. The justices acted on a petition for review filed by Mason Harry Rose V, a southern California attorney whose disbarment was recommended in 1997 by both the hearing and review departments of the bar court. Rose, who has a long record of discipline, claimed the Supreme Courts practice of summarily denying review of discipline recommendations, without holding oral arguments or issuing a written decision, violates lawyers due process rights. More than two years after Gov. 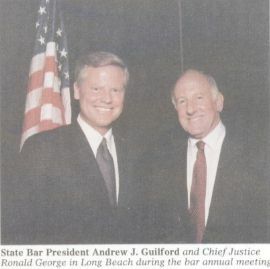 Pete Wilson and Republican legislators targeted the State Bars Conference of Deleg-ates for taking what critics thought were too-liberal political positions, the conference still is struggling to get back on its feet. Relegated to a kind of separated-but-still-married status, it now is financially independent from the bar but still bound by bar rules governing its activities. Limited fund-raising success has left the 500-member volunteer group without a staff and virtually unable to lobby for legislation. The State Bars senior executive for administration and finance since 1987, T. William Melis, resigned last month to take a position with a foundation devoted to the study of humanities. Melis was named director of finance and administration at the Packard Humanities Institute in Los Altos. He joins a growing list of top bar executives who have departed just prior to and during the State Bars political and financial crises of the last few years. The exodus began with the announcement in early 1997 of the retirement of longtime executive director Herbert M. Rosenthal. In that time, 10 senior executives have departed, including the executive director named to replace Rosenthal, Steven Nissen, and the interim executive director appointed just a year ago, longtime bar secretary Jeffrey T. Gersick, who left the bar last month. The board of governors hopes to name a permanent executive director this month following a nationwide search. Currently serving as interim executive director and secretary is the bars general counsel, Marie Moffat, who, like Gersick before her, does not want the top job.